HBO's Succession seemed to come out of nowhere. Created by British comedy writer Jesse Armstrong -- of Peep Show and The Thick of It fame -- the slick, slimy show about a dysfunctional family who own a global media empire quickly became our summer obsession. It's hard not to fall under the Roy family's spell; they're so enticingly dramatic and duplicitous that Succession feels at times like a soap opera, at other times like a horror movie, and still others like a screwball comedy. Brian Cox stars as Logan Roy, a Rupert Murdoch-like media titan, who reveals his plans to leave the family company -- an empire that spans newspapers, TV stations, and even theme parks -- but walks back on that promise after his ambitious son Kendall (Jeremy Strong) shows interest in taking over. Also involved in the family's in-fighting is Logan's daughter Shiv (Sarah Snook), other sons Roman (Kieran Culkin) and Connor (Alan Ruck), wife Marcy (Hiam Abbass), and great-nephew Greg Hirsch (Nicholas Braun). The show is a dark comedy in the vein of Armstrong's other projects, with a handsome pedigree: Oscar-nominated director Adam McKay directed the pilot, and executive produces alongside newspaper columnist Frank Rich and actor Will Ferrell. That street cred, coupled with the show's inherent watchability, made Succession a breakout hit this summer. We can't wait for it to come back, but until it does, here's everything we know about season 2. 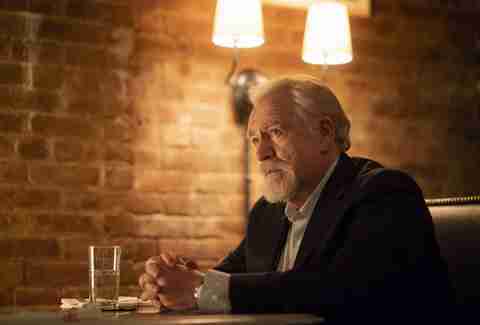 What is Succession season 2's release date? No word on an exact release date yet, but HBO officially renewed the series for a second season in June -- just a week after the show premiered. If it follows the same release schedule, we can probably expect new episodes to hit the cable channel sometime next summer. Will the whole cast return? There's no reason to believe they won't. All of the major characters survived season one, so save some surprise cast departure, we can probably expect to see all of the Roys return next year. When asked about potential new character for season 2, Armstrong told The Hollywood Reporter, "It's too early to say, I'm afraid." He also nixed the idea of the show having any big-name cameos: "I think some shows could accommodate that, but I don't think we could." What will the plot be? Season 1 of Succession ended with a bang. Kendall Roy was planning an aggressive takeover of the family company, but wound up accidentally killing a young waiter in a car crash while out looking for drugs. Logan, who learns about the boy's death, offers his son a deal: He can make it so the crime never happened as long as Kendall stops pursuing the company's top spot. Kendall breaks down in his father's arms and the two share a tender moment, but it's unclear what will happen next. If Kendall takes his father's offer, he'll be working under him for the foreseeable future. But if he doesn't, he'll undoubtedly face jail time. We can't say for sure what will happen, but we do know that Armstrong is already hard at work on season 2. "We've got a very early shape, but it could change," he told THR, adding that he'd like to explore other facets of the company. "People will find it interesting to see how the theme park runs, and the news channel and some other divisions of the company. That's one initial thought." Follow the Thrillist Entertainment on Twitter: @ThrillistEnt.